Lou Reed - The Blue Mask. Vinyl LP. Bleep. 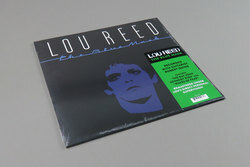 Lou Reed’s 1982 LP The Blue Mask gets the reissue treatment. Reed’s eleventh solo full-length finds him at something of a crossroads, approaching middle age while still stuck in his rock ‘n’ roll ways. The tension leads to poignant meditations on marriage, alcohol abuse and growing old (although not necessarily on growing up). Marry this new-found wisdom with some of Reed’s best songwriting since Transformer and you’ve got one of the late rocker’s quiet masterpieces.